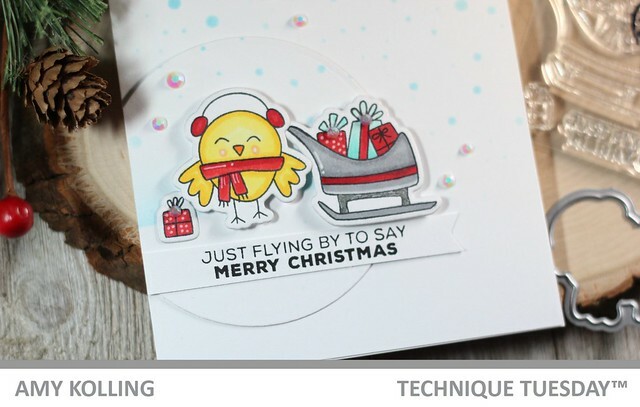 Technique Tuesday just released some brand new Christmas products and we're celebrating with a mini Christmas Blog Hop! We will be releasing more Christmans products in October and November as well! Stay tuned! I had some fun coloring these adorable images from Christmas Birds. I started with sponging Broken China Distress Ink over a snowfall stencil and a die cut circle. I colored and die cut the images embellishing them with a white pigment pen. I added the images to my scene with foam adhesive as well as a sentiment banner. A few white gems were added as "snow". Technique Tuesday will be giving away a gift certificate to someone who comments during the mini hop on one of the stops. Comments will be taken until September 20th. The winner will be announced on the Technique Tuesday blog on September 22nd. So cute. I like your coloring and the snowfall background. Like the addition of the beads. Oh, this is such a tweet, er, sweet card! I love that there is a snowfall stencil too. What a TWEET card! Great coloring! CAS! These little bird stamps are so cute! So stinkin' cute! I'm always a fan of the birdies. Eeek! This is the cutest card...love that little bird! This is so cute!! And perfectly CAS! Adorable card! Fabulous coloring and composition. I like the simplicity of your adorable card. sweet bird and fun design. Oh my!!! I'm totally in love for this adorable and cutie card!!! Love it!!! I really like how you added to the snowfall with the white crystals and how you highlighted your focal image with the circle. Small things, but so effective! Thanks for the ideas and sharing them with us. AWWWWW what a precious card! Your coloring is fantastic! I also like how you finished it off with some beautiful gems!